You are going to travel to one of those dolphin paradises and plan to take a dolphin watching or diving tour? There are several issues to consider when picking a dolphin or whale watching tour or swimming with dolphins tour. At every dolphin watching or diving place, there are several tour operators therefore picking the right one is the starting step to have a wonderful experience. Here are a few recommendations although the number one issue we are considering (and you should always consider) is your security. What kind of boat are you using? This question is mainly oriented to know if it is a boat or an inflatable, mainly ask how many feet the boat is and what material is made of as well as the kind of motors it has. Always ask if it is equipped with an emergency radio (this is the main question of all). If the boat does not match the description you received when doing your research, refrain from boarding. Also, if you don’t feel right about the boat when arriving, do not board it. This is one of the important security issues. The boat does not have to be a large boat or a yacht, but you should know in advance what will you get and where will you board. Most of the diving I have done in the ocean have been on inflatables. They are very reliable an suitable for several applications. The last one I bough was a Sea Eagle inflatable. They have affordable and quality inflatables. You should always ask your provider, how long the tour is going to be. It will be one hour? Four hours? All day? This is important not only to get what you are paying for but also to take with you special items you might need in case the tour is too long, like food, glasses, sun protection, additional clothing, etc. If the tour is longer than three hours ask if there is any food or drinks included, otherwise, it is advisable to take yours. It is another important security measure that you know where are you going and let know other members of your party. If everybody in your party is going with you to the tour, you should tell your hotel where you will be going, what company you hired and how long you will be away. This question is much related with the size of the boat. If the tour is shared with other people, make sure the boat is not overcrowded. If the boat is an inflatable, take additional care of the number of people going into the boat. Don’t forget to count crew members as some companies take the limit boarding capacity of the boat but they additionally take 4 or 5 crew members, exceeding the boat limitations. Ok, this is difficult, but at least you will get some commitment from the tour operator. 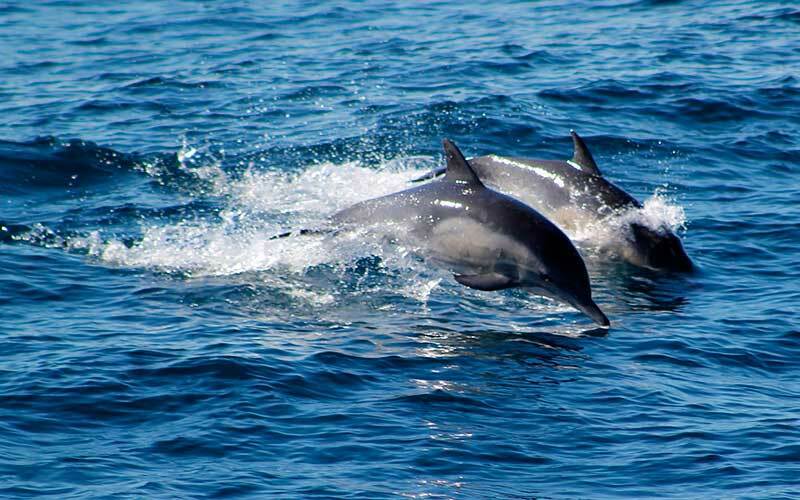 We all who know the sea are aware that any decent tour operator will not be able to guarantee you watching dolphins or whales because even if they are at the same place every day, that day something could happen that they are not in the same place and you should be aware of this, however, is good to know what are your tour operator intentions. Ask about how they contact dolphins or whales because some of them really buther dolphins by getting into their way. Always ask in advance how much will the tour cost and what will be included for that cost. This should be one of the last questions after they have provided you the information above. Don´t forget to ask for child price if you are taking kids with you. What crew is going in the trip? Now is the time to get serious. Remember that there are two kinds of tours, watching and swimming with dolphins. Although in both cases you should be careful about the crew, in case you are diving, take extra care. If you are not a trained diver (not only experienced…) make sure a trained diver is going with you. Hundreds of problems can arise while diving that only a very experienced and trained diver can solve properly. If you are going with other people from your party, it would be a great security measure to leave one of them in the boat, in turns if necessary, so there is always somebody aware of your security on board. If everybody is going down, make sure to keep all together while diving and be sure to be noticed by the crew so they do not leave you in the ocean (it has happened…). This is also extremely important if you are diving or swimming with dolphins. If you are not taking your own equipment, ask the operator about the condition and the kind of equipment that you will receive. For any kind of tour, watching or diving, you should be sure that they have a life jacket/vest for anyone boarding the boat. If you would like to take your own equipment, I have got great prices and sevice for water sports equipment at Overton’s. If you are planning your travel adventure to watch or swim with dolphins, don´t forget to print your destination miniguide.